Spring has come to KS. The days are growing warmer and the tulips are blooming--again. I thought it was sweet some of the yellow ones did not come up the first time, just the pink and red. They of course got covered in snow. I wanted to share a project i was working on this am (instead of grading tests, tsk tsk tsk). 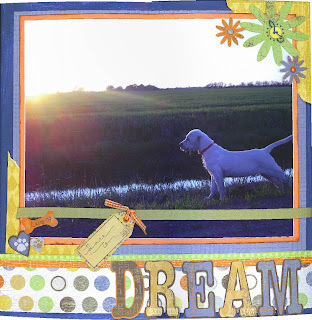 I enlarged the photo of lacy in the sunset and mounted it on canvas as a scrapbook page. I think it turned out sweet, unless of course you are a photo purist who hates how we scrapbookers cut and decorate photos! I tried not to overdo it. The little tag says, "dare to" DREAM. A full size layout can be found at the link above. 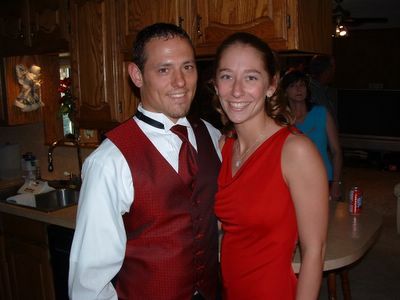 Check it out I am also working on our wedding album and those pages are there too! Great choice! Don't you love the way we can capture a moment with a photo? The visual image helps us remember the other sensations of that moment... the breeze, the sounds, the smells... I love the memories and photos help rekindle those memories. Not only that, but you can share those with others around the world. Thank you for sharing your memory!